African governments are spending more of their own money to combat the AIDS virus, malaria and other health plagues, but a senior global health official says progress in preventing infectious diseases could slow if the EU and other donors skimp on their aid. Africa has made inroads in combating tuberculosis and the HIV virus, which along with malaria are leading killers in the sub-Saharan region, according to a new report by the United Nations’ AIDS agency and the African Union. But while HIV and TB rates have fallen, the report shows that malaria deaths continue to rise in some countries and the insect-borne disease takes a particularly severe toll on mothers and children. The report comes 12 years after African leaders made a commitment in Abuja, Nigeria, to spend at least 15% of their national budgets on health and do more to prevent the AIDS virus, TB and malaria. A month after the Abuja Declaration, the EU launched its ‘programme for action’ on infectious diseases to back up the African efforts. Since then, domestic health spending in the 54 AU member states has grown fourfold – from $14 billion to $52 billion, equivalent to €40 billion at today’s exchange rate. However, private financing outpaced government spending, growing from $17 billion in 2001 to $55 billion in 2011, and just six AU nations have reached the Abuja target, according to World Health Organization figures cited in the report. While both TB figures and HIV infections have been on a downward trajectory for a decade, the fight against malaria has been less successful and disproportionately kills pregnant women and children under five, says the UNAIDS/AU report released on Monday (15 July). Stepped up attention to health from African governments and international donors is credited with the improvements, but officials warn that a decline in spending could halt or even reverse them. 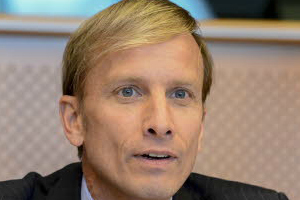 Mark Dybul, who heads the Geneva-based Global Fund to Fight AIDS, Tuberculosis and Malaria, has urged the EU and other donors to sustain their commitments to fight the diseases despite their own domestic fiscal challenges. “The flip side of that unfortunately is that if we do not act now, there is a reasonable and understandable interest in – as economies are recovering – to wait several years before addressing these diseases in a pronounced way. However, infectious diseases don’t respect financial crises and budget cycles,” said Dybul, who took over the leadership of the Global Fund in November 2012. A report released in April by the Global Fund said it needed $87 billion, or €67 billion, through 2016 to finance programmes in 151 nations. Of that, $58 billion is targeted for AIDS/HIV, $15 billion for tuberculosis and $14 billion for malaria. Existing donors, governments in beneficiary nations and private supporters are expected to provide some $72 billion, the report said. Dybul has asked the EU and other contributors for additional $15 billion in “replenishment” funding that is designed to avoid gaps in treatment and prevention from different budget cycles in donor countries. The Global Fund estimates that $87 billion would treat 17 million TB patients, provide antiretroviral therapy to 18 million people being treated for the AIDS virus, and prevent 196,000 malaria deaths. The fund already estimates that money from its biggest contributors – which include the European Commission, EU member states, the United States and Japan – will decline slightly from 2012 to 2013. TB, malaria and the AIDS virus have disproportionate impact on Africa and its sub-Saharan region in particular. Africa is home to some 69% of the world’s 34 million HIV cases and 90% of HIV-infected pregnant women and children. Africa also accounts for one-quarter of TB cases and the figure could be far higher – the UNAIDS/AU report estimates that one in four cases in the region goes unreported. But the report cites steady progress in tackling the infections. AIDS-related deaths declined by 32% from 2005-2011 and some of the continent’s most economically advanced countries – including Botswana, Ghana and South Africa – have seen new HIV infections among children fall by at least half. Availability of antiretroviral treatments has also improved across the continent. Rates for TB fell 10% from 2009-2011 as the availability of diagnostic tests and treatments for the respiratory infection has expanded, the report says. However, malaria remains a leading killer, causing some 600,000 deaths in 2010 with an estimated 174 million cases reported across Africa – or 17% of the population. Creating an AU organisation to present a united voice on health matters in dealings with donors and international organisations. “Abuja 2001 was a historic moment for Africa, the point at which the continent fully acknowledged the scale of the AIDS epidemic,” says the UNAIDS/AU report – Abuja +12: Shaping the future of health in Africa. “Even more importantly, Africa pledged to take decisive actions to address that emergency. In the years since, the progress has been incredible, extensive and – sadly - incomplete. A core element of the 2001 Abuja Declaration was the commitment to allocate at least 15% of public expenditures to health by 2015. Health spending in Africa has risen by about 10% annually in the past five years, according to the UNAIDS/AU report, although only six AU member states - Liberia, Madagascar, Malawi, Rwanda, Togo, and Zambia - have achieved the 15% Abuja target. Established in 2002, the Global Fund claims its efforts have helped reduce deaths and ailments through prevention and treatment. From 2005-2011, the number of AIDS-related deaths fell 24%; mortality rate for malaria fell 26% between 2000 and 2010; and the TB mortality rate fell 41% in the two decades ending in 2011. But spending for treatment and prevention suffered a setback when the Global Fund temporarily suspended project financing in 2011 amid internal management squabbles and allegations of theft in a few recipient countries. The problems led to an overhaul of how the organisation hands out money and the appointment of Mark Dybul, a physician who is co-director of the Global Health Law Programme at Georgetown University in Washington, DC.